I just can’t seem to break the cycle of thin-crust, Neapolitan pizza. I used to love Chicago-style pizza, but in my old age I prefer to eat pizza that’s wafer-thin and heated in a brick or charcoal oven at about 800 degrees until the crust gets crispy and burnt. This style of pizza is just not for east-coast liberals that summer in the Hamptons anymore. No sir, even Chicagoans (and suburbanites) can enjoy it. 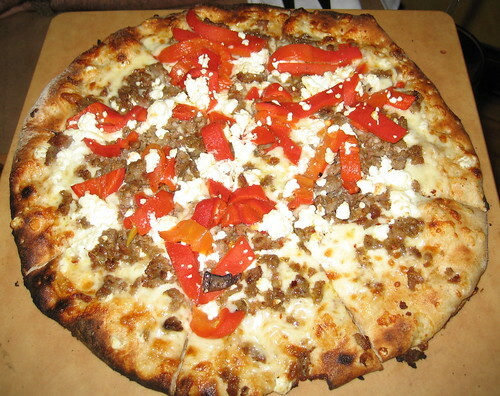 Pictured is just such a pizza from Trattoria 225 in Oak Park. This one is called The Goat and has roasted red pepper, spicy fennel sausage, goat cheese, basil pesto, and house-blend cheeses. This is a great example. Even though I love goat cheese and I love spicy fennel sausage, I would never have thought to put them together on a pizza with roasted red pepper and basil pesto. I’ve said it before, the chef in the kitchen is an artist and for the most part, if he/she says “eat it,” I will eat it. I always order off the menu, never make changes, and rarely season my meals. Would I have told Van Gogh to use roses instead of sunflowers? Would I have told Jane Austen to let Elizabeth Bennet die a spinster? No and No. This is another fine addition to one of my top 5 suburban downtowns. Heck, get on the elevated train and spend a day in Oak Park, you’ll love it. Posted in food on 2007/08/24 by John.